1) The only advertisement that will appear on the front page of ISKCONUK.COM will be ‘premium paid’ fold advertisements. This form of advertising will retain the integrity of the front page as it will just show a small fold at the top right-hand corner of the front page. When the reader places their cursor on that fold the whole advertisement will be revealed. In addition, to also ensure that the UK Charity Commission’s requirements are satisfied, the fold down advertisement will cost £100 (GBP) to remain on the front page for a period of 2 weeks. There will be only one advertisement at any given time. a) PAID: These are advertisements where the individual or company advertising is intending to make profit for themselves. b) UNPAID: These are advertising where in the person or project has no intention of making personal profit but rather any profit that might accrue will exclusively go to ISKCON UK. 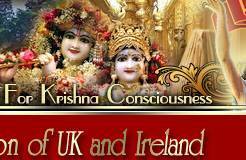 Please note that any and all advertisements that appear on ISKCONUK.COM, whether there is personal profit made or not must be in pursuance and support of the aims in the founding documents of ISKCON UK (find below). a) ISKCON’s Articles & Memorandum of Association.